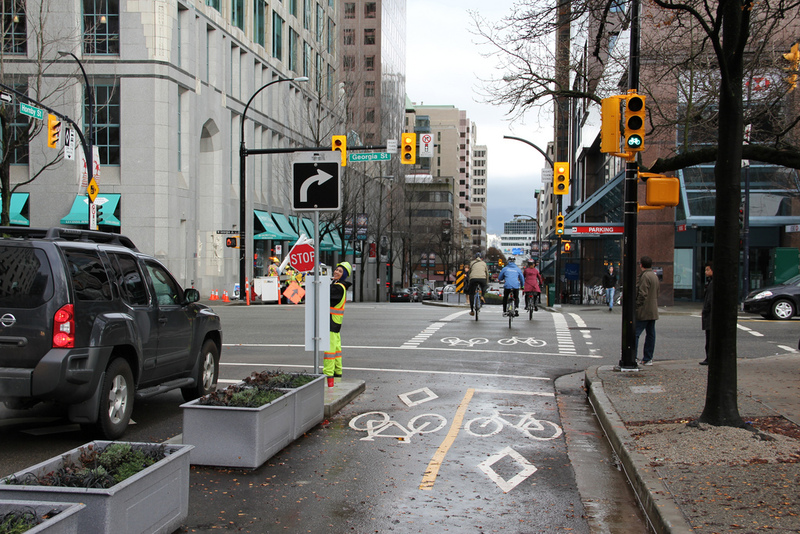 Can the new 102 AVE bike corridor spark transformation in the urban core? On all but a few blocks, where she has to navigate busy downtown traffic, Shute feels comfortable commuting on two wheels. 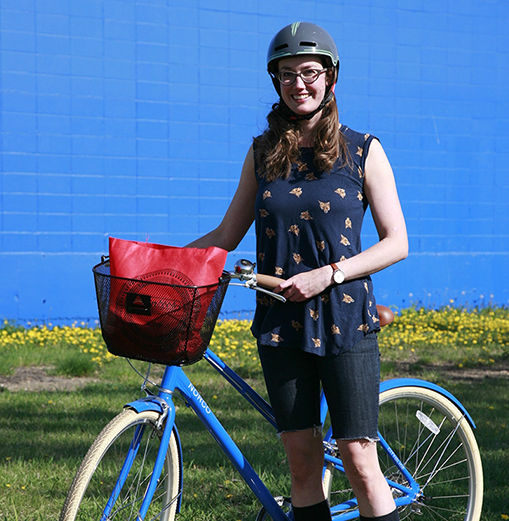 But getting to the point where moderate cyclists like her are comfortable on Edmonton streets hasn’t come easily—and the work is far from done. 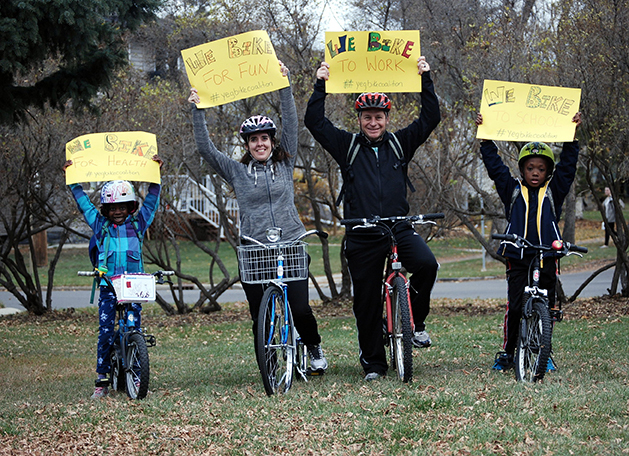 Edmonton cyclists have long been an under-serviced minority in a city that loves its trucks. For their part, drivers are often faced with navigating around vulnerable and sometimes unpredictable cyclists. For cyclists, the streets can be hostile with crumbling curb lanes, confusing traffic signage, disconnected networks and, at times, tonnes of speeding metal piloted by drivers who just don’t give a damn. Potholes might be the only thing they can unite on. It’s festered discontent on both sides—discontent that’s not unique to modern Canadian cities trying to promote active transportation. But while Vancouver, Toronto and even downtown Calgary have taken huge steps toward peaceful traffic co-existence, Edmonton has been mired in a slow process of incremental construction, conciliation and occasional back steps. With the planned redevelopment of 102 Ave. putting new focus on cycling infrastructure in the downtown core, policy makers, municipal planners and cyclists in Edmonton are hoping that will change. At completion, cyclists will be able to pop by the Downtown farmers’ market for some carrots and berries, maybe a latte, visit a boutique or two, check out the action on Churchill Square, attend art galleries, a play, the symphony, and return home—all on one continuous glide from 96th to from there will be a matter of both public and political will. Biking has become a fashionable expression of environmental, health and urbanist consciousness, especially among under-40s. Inspired by these ideals, and by rising fuel costs, parking rates and commute times, more people are getting back on the saddle for the first time since childhood. But it’s not all Jane Jacobs disciples and downtown hipsters spurring the charge, nor is it a new idea— not even for Edmonton. Back in the late 1980s, when the late educator, activist and politician Tooker Gomberg arrived on the scene, political support was lean for bicycle and eco-friendly initiatives. Gomberg quickly got involved with the Edmonton Bicycle Commuters Society, through which he met his life partner Angela Bischoff. Tired of battling an entrenched administration, Gomberg ran for city council in 1992 and won. That year, Council approved the city’s first Bicycle Transportation Plan and began expanding and paving multi-use trails in the river valley. Eventually, work began on urban streets, widening curb lanes, adding sharrows (painted markings indicating shared paths for drivers and cyclists) and extending suburban bike lanes. Combined, this system of trails skirted the periphery of downtown occasionally infiltrating the city centre but never quite coalescing into a fully integrated bike network. Sharrows, introduced in 2010, were especially confusing and frustrating to cyclists and drivers alike. In 2013, then mayor Stephen Mandel lamented that bike infrastructure development was turning into “a nightmare,” after Ritchie residents complained about the prospect of losing parking along neighbourhood streets. It was a major setback for those in government and advocacy who’d dedicated themselves to quelling the growing cultural war. In October 2014, the bike community learned that funding for cycling infrastructure, including another bike lane north of Whyte Ave., might be axed from the 2015 budget. To rally support, the Edmonton Bike Coalition quickly launched a campaign inviting cyclists to share images of themselves on bikes, holding signs reading “I bike,” “We bike,” and “I would bike.” A video mosaic of over 1,000 of these distinct images played on a loop in city hall. In December, City Council unanimously passed an $8.8 million budget for active transportation in the downtown core, with the 102 Ave corridor as a centrepiece. The decision to approve the plan, which also calls for a dedicated cycling path along 105 Ave., north of the Edmonton Arena District, was heralded as a sign of renewed support for bicycle transportation in urban Edmonton. Under Don Iveson, Edmonton’s notably pro-cycling mayor, municipal support for bicycle initiatives is at an unprecedented high. But what does the city have to gain from that? On a larger scale, that question of identity can also be extended to cities. What happens when a city defines itself by its transportation mode? Cities such as Copenhagen and Amsterdam have been redefined by cycling and active transportation, and how it gives life to public space, reduces vehicle congestion and pollution, and, generally speaking, contributes to better quality of life. Places like Portland, Melbourne and, notably, Minneapolis—which has a climate akin to ours—are successfully following suit. These cities are reshaping their urban infrastructure towards bicycles and pedestrians not because it’s easy, but because it makes sense. But does it make sense for Edmonton? The number one thing you need to make it work isn’t infrastructure, but bikes. And there are many of them in the core. According to the Bicycle Trade Association of Canada, 80 per cent of Oliver households have at least one. How many of them get used is another matter. Three per cent of Edmontonians ride their bikes daily, according to a 2013 Bannister poll, while 35 per cent ride every week. Those numbers suggest that the potential is there, but what will it take to convert more of them into regular or even occasional cyclists? Generally, cyclists fall into one of four categories, as identified by Portland transportation engineer Roger Geller. “Strong and fearless” riders, like Coleman, are undeterred by traffic or weather conditions. You might find them charging through stale yellow lights or merging across lanes at the speed of traffic. “Enthused and confident” riders are a little more conservative, keeping to the curb and waiting until all is clear to switch lanes. Combined, these groups account for less than 10 per cent of cyclists. But then there’s “interested but concerned” riders, which comprise the largest population segment, 54 per cent according to a 2013 City survey. These Edmontonians ride a bike now and then, though not on a regular basis nor solely for commuting. They may get out on the occasional leisurely ride on river valley trails but they’re hesitant to engage with traffic. (The remaining 30 per cent is the “no way no how” group for whom riding is out of the question.) Tamsin Shute is somewhere in the middle. Since the fearless and the confident will ride anyway, the City is focused on creating infrastructure for the middle categories, to put them at ease and build their confidence in hopes that they will take up cycling in greater numbers and frequency. According to an independent review by engineering consultant Urban Systems, one of the key things that would make more Edmonton cyclists feel safe is proper, dedicated infrastructure. But what if that political will shifts again? Frustrated, vehicle-bound ratepayers could still pressure the City into cutting funding and scaling back plans. It’s happened before. With so many other major capital projects, as well as growing infrastructure maintenance costs, budget priorities can change dramatically year over year, resulting in watered-down versions of grander plans. As the population swells over the next few years, a legacy of auto-centric urban design will continue to accentuate downtown congestion problems. It will take a consistent, concerted effort by drivers, cyclists, pedestrians, planners and politicians— but the bicycle could be a part of the solution. This entry was posted in 2015 Summer, Feature.